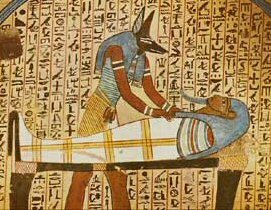 The art of embalming bodies and trasforming them into mummies was believed to be of divine origin and to go back to Horus the son of Osiris and Isis. 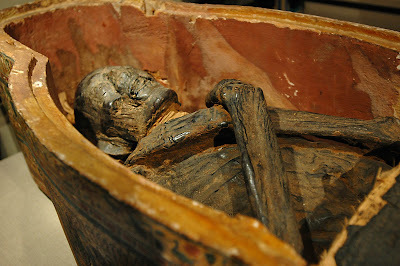 The term mummy comes from the Arabic « mumiya » or « mumyai » which according to the 12th century Arab traveller Adb-el-Latif refers to bitumen or a mixture of pitch and myrrh, a material which was extensively used in the treatment of corpses and which was an important item of commerce even in medieval Europe. At one time a careful distinction was made between natural and artificial mummies, the former category being those which remained intact without treatment. Even today it is believed that the spectacular state of conservation of Egyptian mummies is due more to the extremely arid Egyptian climate, with the resulting total absence of bacteria in the air and sand, than to the enbalming process. Thanks to the presence of well preserved bas-reliefs and paintings in the tombs we have a very good idea of how funerals were conducted in ancient Egypt. Opening the funeral procession would be a group of slaves carrying offerings and objects belonging to the dead man. If he had been a warrior there would be his neapons, if he had been a farmer there would be his farming implements. Next would come a group of professional mourners uttering piercing cries, tearing their hair and singing dirges. Finally behind the master of ceremonies and the priest would be the catafalque in the shape of a solar barge, mounted on a sledge drawn by a team of oxen. Family, friends and relatives followed, dressed in mourning, uttering cries and lamentations. Right at the back of the procession would be a group of women singing the praises of the dead man. Along the way would be gathered the idle and the curious. If the cemetery was on the other bank of the Nile, the funeral procession would cross the river, the catafalgue would be placed once again on its sledge and the different groups would form up again in the same order. When finally they arrived at the tomb the mummy would receive the offerings and the final good-byes of family and friends. There then followed the « ceremony of the opening of the eyes and mouth » by means of which the dead person had their senses restored to them. The mummy would then be laid in the tomb. We shall now look into the question of how the body was mummified. The body of the dead man was handed over to specialists who proceeded to embalm it. The first operation consisted of extracting the brain via the nostrils by means of a hooked tool. The brain cavity was then filled with a material consisting mainly of liquid bitumen which hardened on cooling. The eyes were then removed and replaced by porcelain substitutes. By means of a sharp stone an incision was then made in the left side of the body and the intestines and internal organs removed. These were treated with boiling bitumen and wrapped up. The brain and the liver were treated in a similar way. The viscera were preserved in four canopic jars made of clay, limestone or alabaster, in some cases even of stone or metal depending on the station of the dead man. These jars which were placed in a coffer near the mummy had lids each of which had a different head on it: man, jackal, sparrow-hawk and dogfaced baboon. The cavities in the gut and stomach were carefully washed with palm wine, dried with a powdered mixture of aromatic plants and finally filled with myrrh or perfumed sawdust. The body thus prepared was placed in a solution of natron (sodium carbonate) and left for seventy days. After this treatment the flesh and muscles had completely dissolved away and nothing remained except the skin attached to the bones. The hair of men was cut short while that of women was left in all its splendour. Bandages impregnated with resin were wound round each finger then round the hand and finally round the arm. The same procedure was carried out on the other limbs. For the head even greater care was taken. The cloth in direct contact with the skin was rather like muslin. The face was covered with several layers of this material and the degree of adhesion was so perfect that when removed as a whole it could be used as a mold to make a plaster cast of the dead man’s features. The whole body was then wrapped up in the same way. The body was arranged in an extended position either with the hands crossed on the breast or with the arms extended along the flanks. The bodies of the pharaohs were wrapped in a sheath of repousse gold work which reproduced the shape of the body in relief. The state of preservation of the mummies in the Egyptian museums in Cairo and Alexandria as well as those in foreign museums is pretty well perfect. The oldest known mummy is that of Sekkeram-Saef, son of Pepi I (IVth dynasty) which was discovered at Sakkarah, near Memphis, in 1881 and which is now in the Cairo Museum. The great skill of the embalmers has thus enabled the likenesses of the great pharaohs to be transmitted to us down the centuries. In the withered head of Mernefta, believed by many to be the pharaoh of the Jewish Exodus, we can still recognize the characteristic family nose as well as the eyebrows which are still quite thick. In that of Ramses II X-ray examination has shown that he undoubtedly had trouble with his teeth.